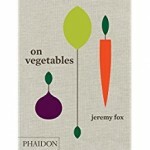 Known for his inventive vegetable dishes, author and chef, Jeremy Fox presents recipes for seventy five signature dishes and seventy five larder recipes in his book, On Vegetables. Although not a vegetarian, Fox believes that plant edibles should get as much attention as animal based foods and that plants should be used from seed to stalk. Accordingly, his recipes reflect his enthusiasm for every edible part of a plant and were written with the aim of expanding horizons and helping people change the way they think about vegetables. The signature recipes are listed alphabetically by main vegetable beginning with artichokes and ending with zucchini are mostly side dishes with a few dessert recipes tucked in. We find such unique combinations as: beet gazpacho with mustard, cherries and almond; borage and ricotta dumplings in mushroom broth; and tandoori carrots with labneh and vadouvan; as well as bread au chocolat, bananas with crème fraiche, honey and curry cashews; and poached pears with seeded granola and sunchoke milk. The larder recipes are arranged by use (blended seasonings, condiments, dough, etc) and then alphabetically. They include directions for homemade salt, squash seed gremolata, and cured egg yolk as well as carrot crumble, lavender almonds, and garlic confit puree. Each recipe has an introduction giving background and/or cooking tips, a list of ingredients, step by step instructions, and a full page color photo of signature dishes( but no pictures for larder recipes). Some of the ingredients like fennel pollen, pea tendrils, and oca are hard to find and many recipes call for making several other recipes to complete the entire dish. The recipe for the carrot pasta dish, for example, requires three recipes from the larder section. 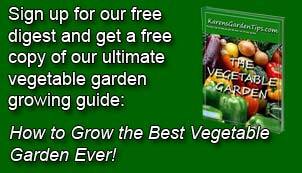 If you are interested in taking vegetables to a whole new level, On Vegetables, is a good resource. The complexity of the recipes and difficult-to-find ingredients require more devotion than most people are willing to give for an everyday meal but may be worth the effort for company fare. Just reading the recipes can expand horizons and thus bring enjoyment when dinning out where someone else is doing the cooking. To buy On Vegetables from Amazon.com Click Here.